In enterprise environments it can be useful configure AgWare software prior to the end users opening the software for the first time. To accomplish that AgWare checks for a set of registry entries for override values before configuring defaults for a new user. These registry entries must be created and deployed using your own methods. There is no way to set these defaults in the AgWare installers. The following values are used to configure a new system. Users can choose to override them with their own values. 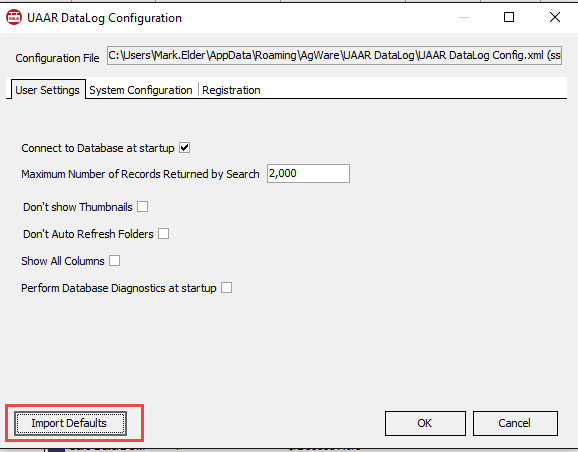 Users can click an “Import Defaults” button at the bottom of the configuration screen to overwrite their values with the values set in the “Defaults” registry. This button will not be visible unless the defaults registry key is present on the computer. The remaining items are less common but can still be configured. There is no need to create an empty value for these items if they are not being use. Anything that is missing from the registry key will have AgWare defaults applied.